Latin America is no longer the “US’ backyard” and the US shouldn’t be “lecturing less developed countries” on “rights and freedoms,” while breaching international law with massive surveillance campaign itself, Ecuadorian FM Ricardo Patino told RT. 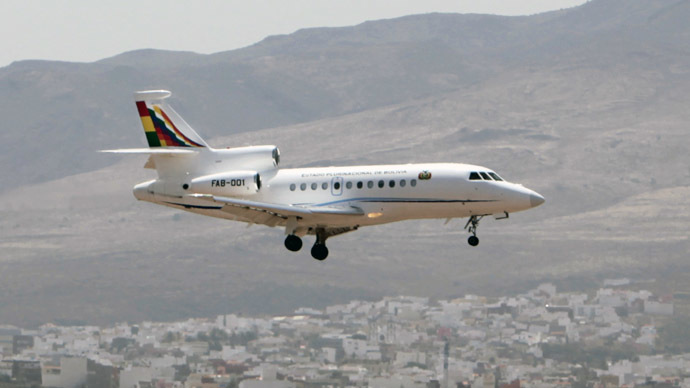 Patino also said the incident involving Bolivian President Morales, whose plane was forced to make an emergency landing in Austria, cannot be ignored and that if such an incident had happened to an American or European leader flying over a Latin American country it could have sparked a war. The Ecuadorian foreign minister spoke to Eva Golinger on RT Spanish. RT:Mr. Patino, thank you for joining us here on RT. Ricardo Patino: Thank you, Eva, thank you for inviting me. I would like to greet all the people who are listening to us all over the world. Listening, not eavesdropping. RT:I would like to start with the most recent events. The presidents of Venezuela, Bolivia and Nicaragua have officially stated that they are willing to grant political asylum to former CIA employee Edward Snowden, who revealed top secret information on the US espionage program. The three countries are members of ALBA, so this step was perceived as a kind of collective asylum offer by the whole region. What is Ecuador’s stance on the neighboring countries offering asylum to Snowden? As of now, is Latin America the stronghold of justice and solidarity? RP: While going through democratization, developing in social, economic and political spheres, Latin American countries also secured their position in the international arena and now express their own opinions. The 1954 Caracas Convention on Diplomatic Asylum states that Latin America is concerned about human rights issues. We considered Julian Assange’s request for asylum last year, and similarly, we have considered Snowden’s. We welcome other countries’ willingness to grant asylum to Snowden. After what happened to President Evo Morales there’s no doubt that Snowden is being persecuted on a global level. RT:Mr. Patino, you said that the Ecuadorian authorities have considered Snowden’s request for asylum. Are you still considering it? That is, is Ecuador still considering the possibility of granting asylum to Edward Snowden or is it enough that other Latin American countries have offered it? RP: In my opinion, the more countries offer asylum, the better. Naturally, Ecuador is still considering this possibility, but it’d be better if 10, 20, 100 states offered asylum instead of just three. More countries should realize what he did, what he uncovered and consider granting Snowden asylum. RT:How significant is the information about the US mass espionage that Mr. Snowden revealed for Ecuador? Ecuador has a long history of its own when it comes to the CIA and whistleblowers. For example, in his book former CIA agent Philip Agee revealed the US involvement in a coup in Ecuador. Did this new information come as a surprise for the Ecuadorian people or were they ready for it? RP: It was more than just a surprise – we were outraged. We knew the US was doing it, but now it’s been unequivocally proven. It just indicates that the American intelligence agencies responsible for ensuring ‘security’ have refined their tactics. In the past they planted bugs to find out what our presidents thought. They keep doing that, by the way. Recently, about three weeks ago, we found a hidden microphone in our embassy in London. But the technology has gone way beyond that. Now they know what people all over the world say, and getting close to their targets to plant bugs isn’t as important. They control communications on the global level, and many transnational corporations, unfortunately, are their partners in crime, which allows them to violate international laws and agreements. RT:Minister, you just mentioned the recently-discovered microphone in Ecuador’s embassy in London. It was determined that the microphone belonged to a private British surveillance company. 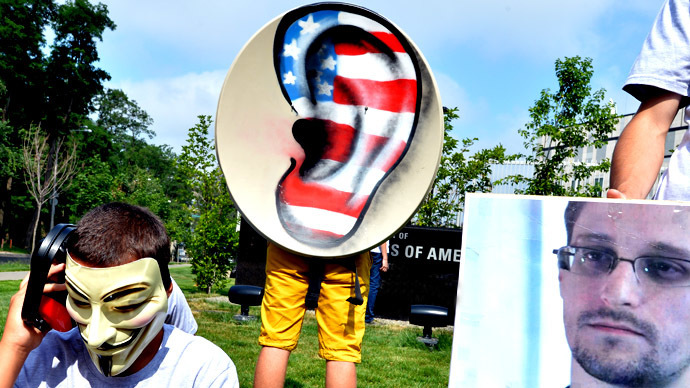 Do you believe they were spying on you according to Washington’s instructions? How are you planning to fight such outrageous violation of your country’s sovereignty? RP: This situation certainly is outrageous. We asked for UK’s cooperation in this investigation to determine who exactly was spying, and where this information was transmitted to. According to our preliminary investigation, we suspect that the surveillance company CK was receiving the data. But we need the UK’s technical assistance to confirm this information. Also a criminal case should be started. It is unacceptable to spy on a country’s diplomatic mission staying in another country upon the latter’s invitation. We don’t have such technical capacities as developed countries do. But we are convinced that in this case, the UK will show the proper tolerance, unlike in the case of Assange, and will help Ecuador in its efforts to find those responsible for espionage in our embassy. It’s hard to tell now when the bug was planted; it’s much easier technically to find out who was receiving the data, which we will hopefully do with UK’s help and permission. RT:Let’s go back to the information leaked by Edward Snowden. International media have reported the recent mass espionage by the US in Brazil. What does Ecuador think about it? Do you think the US could’ve performed the same kind of espionage in Ecuador as well? If so, how would it impact your relations with Washington? RP: Sadly, the more information we get the more we are frustrated. Other than Brazil, espionage has been reported in a number of countries, including Ecuador. I just learned about it several minutes ago. There’s evidence that the US has been spying on our countries. The entire world has been affected by the US espionage, whether it’s alleged enemies or friends and neighbors of this country. At a certain point, someone mistakenly referred to Latin America as the US’ backyard. So we’d like to ask the international community if they think the US has lost its so-called back yard and decided to establish it elsewhere. In Latin America, this kind of era is coming to an end, and we will never be anyone’s backyard the way it was during the military dictatorship times. This is now a proper sovereign developing region, and its people are growing stronger. Our way is the way of ideology, so it looks like other regions are now becoming the US’ backyards. Some countries had been subject to espionage and sovereignty violation, but didn’t demand a response from those who breached the international conventions. Instead, they took such severe measures as in dealing with President Morales when his life itself was jeopardized. So one should be careful saying where the backyard really is right now. 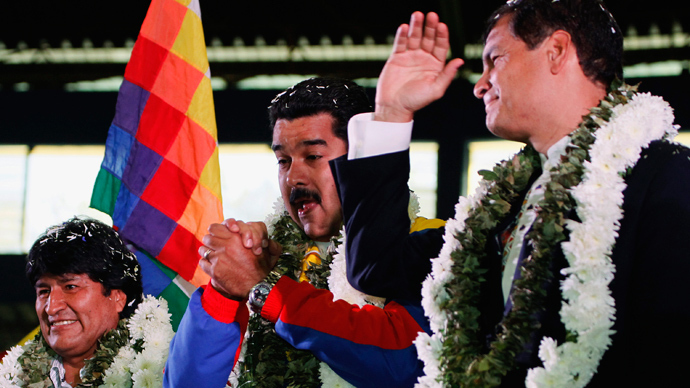 Latin America, including Ecuador, has a higher level of sovereignty and independence. 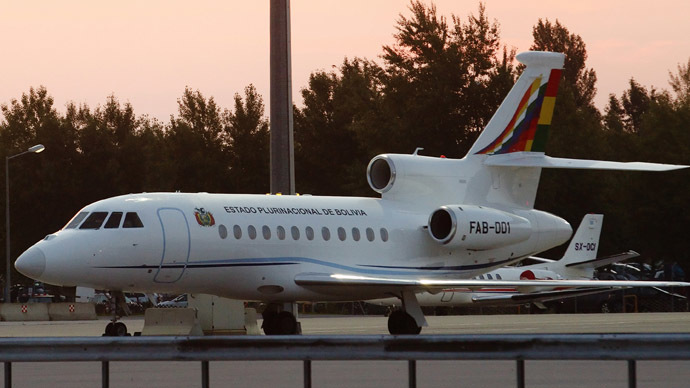 RT: Let’s talk about the recent plane-grounding incident when the presidential jet of Evo Morales was forced to land en route from Moscow to Bolivia. Some European countries abruptly blocked their airspace to him, and that made President Correa call an emergency summit of the UNASUR in Cochabamba. The summit came up with a statement that unanimously condemned the illegal action undertaken against President Morales. So have the Non-Aligned Movement and The Group of 77, which represent a large part of the international community. 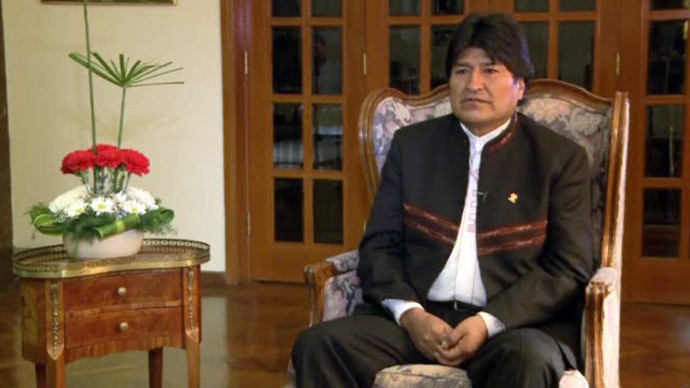 They expressed their anger over the incident and openly supported Bolivia and Latin America. But what specific measures can be taken to rebuke these European countries that committed such an offensive act against Bolivia? Are any sanctions possible? RP: When we talk about the Latin American response to the incident, please bear in mind the differences that we have. You can’t say all the governments think alike. Yes, there is a certain common ground. However, when a tough response is required, the governments take diverging positions. But it is true that the incident caused a strong response. Remember that the Organization of American States is meeting today and we hope it speaks no less strongly and convincingly than the countries that have already voiced their opinion on the subject. The OAS Secretary General has already given a clear and timely comment in his praiseworthy statement. What we should do is turn those countries accountable for their behavior and make them apologize. We must make the situation clear. It’s not like Mr. Morales was told they wouldn’t allow him to leave Russia – although that would have been a true debacle. The incident took place during the flight, when he had already had the permission to cross France’s airspace. And that’s when they told him, “Mr. President, you cannot enter our airspace.” They endangered his life, because he wanted the plane to go back and request permission to fly over some other country, but they told him he couldn’t do that either. That’s why the presidential jet had to make an emergency landing. That was too much! 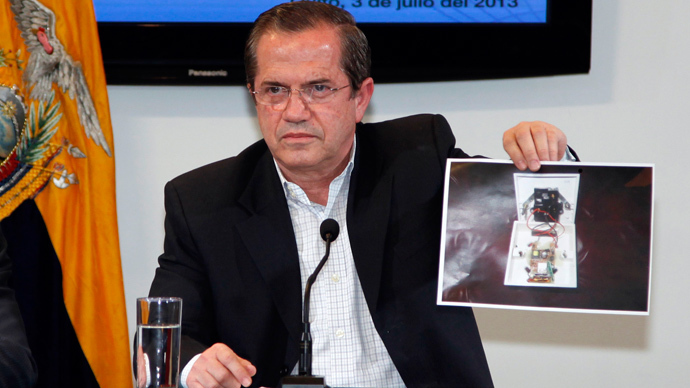 President Correa made it clear that this incident cannot be ignored. Had that happened to a European or US leader flying over a Latin American country, it could have started a war. They would have immediately sent bomber planes and troops to that country to ‘save’ their president. So we decided we should act accordingly. What we wanted was to get those governments to apologize and assure us that would never happen again. You can’t go on discriminating against countries, believing that international law is applicable to some and not applicable to others. You can’t divide countries into first-class and second-class. That’s unacceptable! This is a violation of every international agreement and every human right – just like this pervasive international espionage. Not only does wiretapping our phone calls and reading our letters go against ethics, but it also blatantly infringes upon Article 12 of the Universal Declaration of Human Rights, which enshrines the right to privacy, the right to be protected against being spied on. Now, the Declaration certainly has a different wording, but I gave you the general idea. It’s high time we started to respect all the countries in the world instead of putting some of them above all others. RT:Now that you mentioned sovereignty, international law and its violations, let’s move on to Julian Assange, who has been locked up in the Ecuadorean Embassy in London ever since you granted him asylum. However, he hasn’t been able to travel to Ecuador, since the British government refuses to recognize the asylum or to grant him safe passage. You have met both with Assange and the British government officials. Have you been able to work out a solution, or do you see a solution in the future? We can see Ecuador’s sovereignty and the rights of Julian Assange breached. So what is there to expect in the coming months? RP: We need to make a few things clear. First, Ecuador never ceases to offer alternative ways out of this problem. We have even put forward a legal cause – though there was little need for that. It would’ve been enough to say that Assange asked us for asylum, and after looking into the situation, we decided to comply with his request. But we decided to go further. We took moral high ground vis-a-vis the British government. By the way, when the Olympic Games started in London, we decided to postpone our ultimate decision so as not to upset political stability in the UK. We exercised a lot of caution and respect towards the UK. And it is regrettable that the UK has given us no response so far. We listed every legally-sound reason that allows us to grant asylum as a sovereign country. And with Britain insisting on arresting Assange and extraditing him to Sweden under European law, we had to draft a detailed document explaining how and why the UK has every right to grant Assange safe passage – or rather, why it actually HAS to do that. As the British have acknowledged, this has to do with conflicting laws. On the one hand, there is an international agreement that allows Ecuador to grant asylum to Assange. On the other hand, there are European laws that allegedly bind the UK to extradite him to Sweden. But there is a certain hierarchy of laws. In this hierarchy, international humanitarian law is what matters most. So it is more important to abide by international humanitarian law than to meticulously follow all the criminal proceedings to arrest and extradite Assange. And there are of course human rights to be respected. So we had to explain this hierarchy in the document I handed over to the British Foreign Secretary William Hague on June 17, if I remember the date correctly. The document was supposed to convince him that he is obliged to grant safe passage to Assange under international law. We asked him, so what is the UK waiting for? Would you like Assange to grow old and die in our embassy? Or would you like to see him fall ill and receive no medical help? He has already been warned that once he leaves the embassy, he will be arrested straight away – even if he is seriously ill. Is this what you are waiting for? I keep asking myself: how do the British and the rest of the world see this situation? It is actually rather grave. We can see here a breach of international law by the same people who have long sought to lecture us on rights and freedoms, who demand legal security from relatively less developed countries, claiming they need it for investment. But we want legal security in everything. It’s not only money that needs legal security, but so do people, too. This is the truth we want to get across to the West. It is unfair to ask legal security for money only. What you first need to take care of is legal security for people and human rights. RT:Considering that Julian Assange hasn’t managed to get to Ecuador this past year, do you think it’s possible for Edward Snowden to arrive in one of the Latin American countries that offered him asylum? RP: I think it’s possible. Let’s not forget the numerous political events, toughest situation that the world faced. Take, for example, the last century – in particular, the events in Latin America. So many blood-soaked dictatorships and many cases of political persecution besides. What many European countries did in these cases, and what Latin American countries did, was protect the persecuted people. No one asked them if they had a passport or a visa or guaranteed safe passage. Those were obviously the cases of political persecution, so we took these people under our protection, transported them to other countries. I’m talking about all the countries in the world – well, maybe not all, but most of the countries that claim to be democratic and committed to protecting human rights. We took these people under our protection. For example, many Chileans, Argentinians and Uruguayans came to Ecuador and asked for asylum. They left their home countries in any way they could to save their lives. Most European countries also protected them. They didn’t ask the persecuted to show their birth certificates or passports or visas. No. These people were running from political persecution. So I’m asking myself, isn’t it the same with Snowden? And then this incident with President Evo Morales’s plane. If anyone had any doubts about Snowden being politically persecuted, it’s become crystal clear now. RT:And the last question. Let me ask you about an event that had a major impact on all Latin American countries – Hugo Chavez’s death. It’s been four months since he passed away. He was a leader known worldwide, but he was a particularly important figure for Latin America. He was one of the fathers of the Latin America as we see it now – united, proud, sovereign and capable of overcoming the challenges superpowers place in its way. What did Hugo Chavez mean for Ecuador and how does his legacy manifest now? RP: Comandante Hugo Chavez was a unique person whose legacy lives on in Latin America. He was the herald of this second turning point on the way to independent Latin America. He fought for it on his own in difficult circumstances, at international meetings, where he defended Latin America’s independence, sovereignty and the right to development. The solidarity with Latin American nations that he expressed is praiseworthy. We cherish Comandante Chavez’s memory from the bottom of our hearts, blessed be his soul. His legacy is of vital importance. It’s not only his legacy that he gave us, but his friendship and his care. We remember him with love in our hearts, and we feel the same love towards his people. We would like to express our support to Nicolas Maduro and the Venezuelan government that will continue Hugo Chavez’s political course on their own, without his prominent personality or the importance it had for Venezuela and Latin America in general, but with more determination, because Latin America has high expectations of them as well. 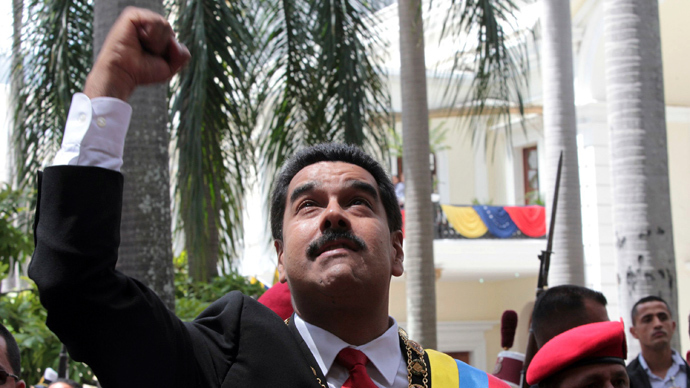 Latin America will keep developing thanks to Hugo Chavez’s legacy and Venezuela’s new government. RT:Latin America, without a doubt, cherishes the memory of Hugo Chavez. Thank you, Ricardo Patino, Foreign Minister of Ecuador, for coming to our program. RP: Thank you very much for this opportunity to connect with so many people at once and do it freely and legally, as opposed to other ways some countries employ. Thank you very much.